Every year, these five Maastricht-based institutes (Bonnefantenmuseum, Academie Beeldende Kunsten, Marres, NAiM / Bureau Europa and Jan van Eyck Academie) organize a joint New Year reception. 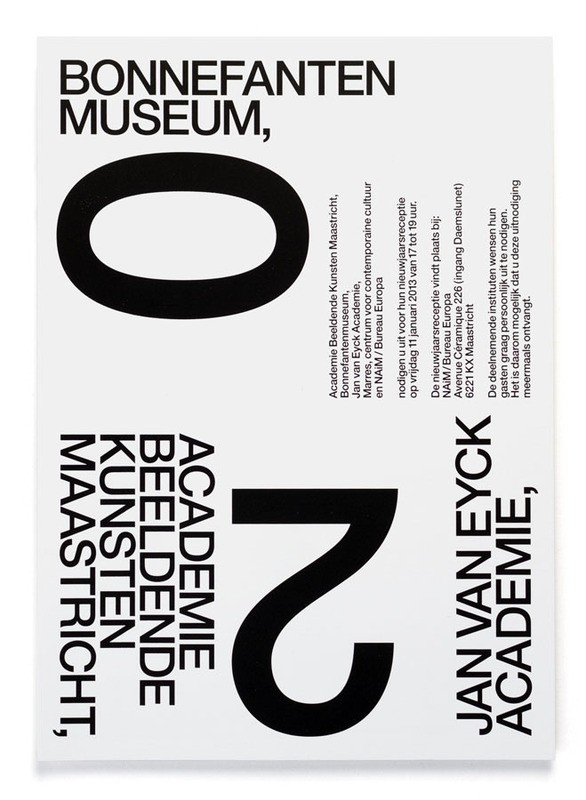 In 2008, we already designed an invitation card for one of these receptions – see Maastricht New Year 1. Five years later, we were asked to design another one. The invitation card we designed in 2013 (or better said, towards the end of 2012) was actually based on the exact concept as the one we designed in 2008. In short, a card consists of several sides (front, back, up, down, left, right, etc.) – so why not give every institute its own side, its own corner, as if every institute has its own letterhead? We like the idea of the receiver holding the card in his/her hands, turning the card around, watching the object from every direction, almost as a sort of ‘micro-choreography’. Moreover, by emphasizing the different sides of the card, we tried to underline its material dimensions – stressing the idea that a card is first of all an object. 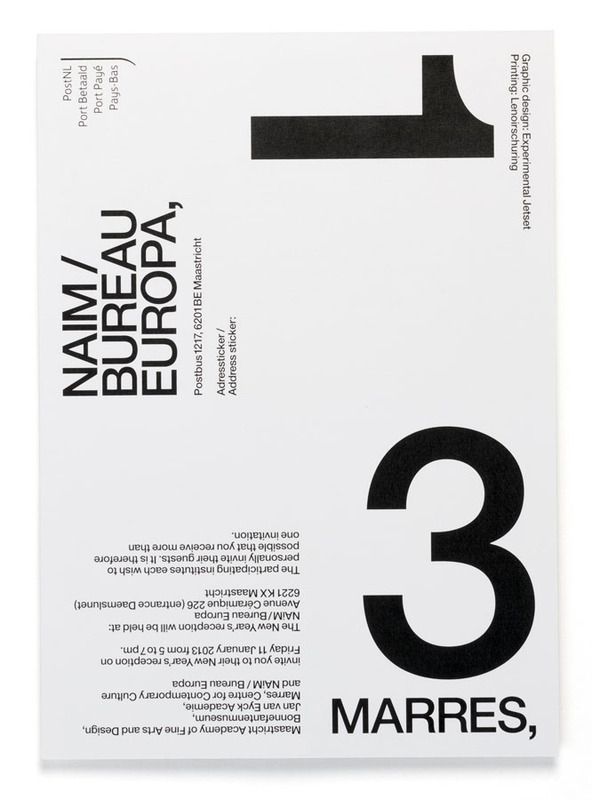 We explored this idea already in 1998, when we designed a letterhead for an architecture studio, each side of the sheet carrying the name of one of the architects (Giljam, Sillem, Plaisier and Jacobs). To the New Year card we designed in 2013, we added one extra element, emphasizing the concept (of one card having several sides) even clearer. By including the date ‘2013’, printed as separate numbers on each side, it seems as if we are suggesting a preferred reading order (0, 1, 2, 3), forcing the viewer in a certain direction. Shown here the front and back of the card. This card is A5-sized, and was offset-printed by Lenoirschuring in Amstelveen.